Let’s Cheers to This is the second full length album from Florida/Michigan based band Sleeping With Sirens. The album was released on May 5th by Rise Records. It was produced by Kris Crummett, who has produced Dance Gavin Dance, Alesana, Emarosa, In Fear and Faith, The Devil Wears Prada, and others. Let’s Cheers to This is this first album I’ve listened to from the band and it was a good first impression on their part. 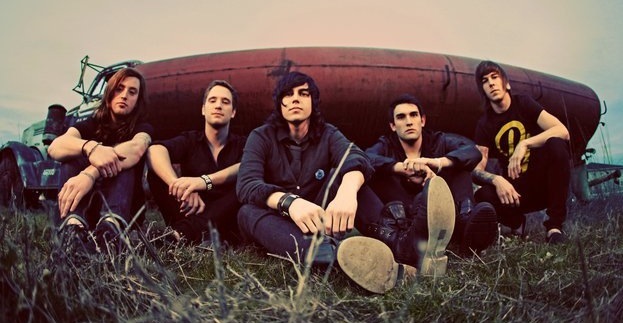 I was thoroughly impressed by Kellin Quinn’s vocal ability. If I were to compare it to anyone else I would say that he is a cross between Jonny Craig and Devin Oliver. The control, range, and power Quinn will blow the new listener away and please the fans. When writing a review for a band I haven’t heard before, I do an extensive amount of research. Without the time to listen to the full discography of an artist, I look up the band biographies, histories, and wiki pages. I did this for Sleeping With Sirens and was surprised to find names like Brian Calzini (We Are Defiance) and Jack Fowler associated with the group. Brian was a founding member of the band and has left. However, Jack was formerly a guitarist for Broadway and has just joined the group. You learn something everyday right? If this isn’t news to you, congratulations, you’re already a fan. I may be 250 words into this review, but don’t think I’m stalling. Let’s Cheers to This is a really great album, I’m just unsure on how to proceed or where to begin. I suppose track one would be as good of a place as any. “Do it Now, Remember it Later” starts the album off with some whoa-ohs and a rebellious tirade of lyrical confidence. “Remember when they said that what we want could never be done? When it all comes falling down, we’ll do what we want to.” I think this band really knows what they are doing and are out to prove it. “If You Can’t Hang” is super catchy and demands attention. Quinn’s significant other seems to have lost her significance. That doesn’t seem to stop him from seeking companionship, however. Unfortunately the same thing happened to him once again. Bummer. The song illustrates infidelity and how beauty sometimes only goes skin deep. I may have found a new break up song. “Four Corners and Two Sides” YOU! YOU! You’ll like this one. It’s rough and bitter. I think Quinn is confident, not confrontational. I think he knows he can’t be friends with everyone and he needs to keep his guard up. In this industry, I’d say that’s exactly what he should be. Something I really like about this song is the play on a Lennon lyric “They say I’m a sinner. I’m not the only one.” Clever. “A Trophy Fathers Trophy Son” is a sad story of abandonment. A father left his family. The son is trying to deal with the loss and wonders if his fathers departure could be his fault. When a boy loses a father, he loses his example of what a man should be. I think the title might explain a little bit of fear. Will he be like his father? Will he leave his family? He is sorting that out. “Fire” is a tough song to read. What I seem to take away from it is that a girl is self destructing and the boy is desperately watching it all burn down. Maybe it’s an addiction she faces, I can’t be sure. Maybe I’m reading this song wrong, but perhaps it’s all up to interpretation. The song is a power ballad and a pretty powerful one, no matter the meaning. “Tally It Up, Settle the Score”. Kids are fighting. Underage and angry, this is his way of getting his point across. Luckily he has studio quality screams to help him with that. Take that girlfriend! “Postcards and Polaroids” is a leaving song. The touring life can be exciting and fun, but it is very tough on relationships. I can only imagine how hard it would be to leave my girl for months at a time. The girl doesn’t have it easy either, she is left at home, sleeping alone every night, and wondering if her man is being faithful. Tour is a true trial for musicians. “All My Heart” is the acoustic break in the album. Quinn’s voice is flawless. Stripping down the instruments really shows how amazing he really is. No auto-tune needed. The song is youthful and romantic. The song swells into a full instrumental to finish. “Let’s Cheers to This”. Finishing with the title track, the band demonstrates that they are here to prove what they’ve got. Let’s Cheers to This really impressed me. The song writing is fantastic, the vocal melodies are amazing, and the musicianship is incredible. I have nothing bad to say about it. I highly suggest buying this record. You won’t be disappointed. Sleeping with Sirens have, no doubt, made a lot more fans than just me with this release. So what are you waiting for? Go buy it now! Don’t wait! I agree. I wouldn’t say this is my best review of their instrumental skills. All of the instrumentals are fantastic, but Quinn’s song writing stuck out to me most. This album remains a must have on my phone. Thanks for reading.